I am Brother Guire Cleary, the first Franciscan friar on staff at Mission Dolores in San Francisco since its secularization in 1834. That I happen to be a friar of the Episcopal Church is a matter of both grace and irony. Today we will hear many papers addressing historical events and the artifacts of history. I wish to address the subject of human beings and their struggles. My topic today is that of Franciscan Poverty and the dilemma of those early California Franciscans living out a vow of Poverty while establishing the most powerful economic engine this region had seen since the advent of human beings some 12,000 years ago. Without this context we run the risk of having a human-free study of history and conservation. As Malcolm Margolian wrote, "...today's carefully restored missions do not portray history. Rather, in the manner of `theme parks' they use the ornaments of history to create a soothing world of fantasy (Margolian 1989:48)." The Franciscan brothers were firstly members of a mendicant order vowed to Poverty. Most religious communities have a form of poverty as a part of their vows, but we Franciscans differ in that our ideal of Religious Poverty includes strong elements of social marginalization, powerlessness and actual penury. In the words of St. Francis and St. Clare this poverty is called "Most High Poverty" or the "Privilege of Poverty," sometimes personified as "Lady Poverty" and "Minoritas" which can be translated as poor or little and interpreted as marginalized. All of the missions in California were staffed by professed friars of the Franciscan Order. The issue of authentic living of Franciscan Poverty was a core issue for every Franciscan in each of those missions. The issue of spiritual poverty permeated their lives and consciences and set a goal for their personal spiritual struggle, as it does for Franciscans of the 21st century. I wish to present some documents relating to Franciscan views on spiritual poverty along with documents relating to the situation in Alta California between 1769 and 1835. Did these foundation documents of Franciscan Poverty stand as the ideals of California Franciscans or as their indictment? The founders of the Franciscan order, Francis Bernardone and Clare Offreduccio of Assisi lived in Italy during the 13th and 14th centuries. They saw the change from a feudal economy to a money economy, from hereditary elites of nobles to the new elites of self-made artisans, especially textile workers, merchants and bankers (Little 1983:8-18). Francis and Clare were deeply troubled by the rise of a money-based economy and believed the only antidote was to live without possessions in a literal following of the Gospel. For this reason Francis was styled "Il Poverello," the "Poor One." This strongly negative critique of wealth led to both identification with the outcast and marginalized and to prohibitions against taking managerial or supervisorial roles in society. The early ministry, dwelling places and clothing of Francis and his followers were those of the poorest and most despised class in their era: men and women afflicted with leprosy. The earliest Franciscans, including Francis, did not initially own their friaries, but lived as outcasts in leprosaria wearing a garb similar to that of lepers (Robson 1999:21, Fortini 1981:206-212). To this day the foundation friary of St. Mary of the Angels in Assisi is not owned by the Franciscans who have occupied it for almost nine centuries, but rented from the Benedictines for the yearly payment of one basket of fish. Francis wrote several Rules of Life which set out how his followers were to live out their vows in a literal following of the Gospel. These various Rules include passages prohibiting ownership, wealth and holding powerful or controlling positions. "None of the brothers should be administrators or managers in whatever places they are staying among others to serve or to work, nor should they be supervisors in the houses in which they serve. .. Instead, they should be the lesser ones and subject to all who are in the same house. And they may receive for their work everything necessary except money (The Earlier Rule VII:1-2,7 , Armstrong & Brady1992:115)." "None of the brothers...should in any way carry, receive, or have received either money or coins, whether of clothing or books or payment for any work....if by chance...some brother has collected or is hoarding money or coins...all the brothers are to consider him as a false brother and an apostate and a thief and a robber (The Earlier Rule VIII:3,7 , Armstrong & Brady 1992:116.)." "I firmly command all the brothers that they in no way receive coins or money, either personally or through an intermediary (The Later Rule IV:1 , Armstrong & Brady 1992:140)." "The brothers shall not acquire anything as their own, neither a house nor a place or anything at all (The Later Rule VI:1 , Armstrong & Brady 1992:141)." After five Franciscans were put to death by a reluctant Sultan of Morocco on January 16, 1220, Francis counseled the friars to go gently and humbly into mission lands. "One way [to conduct oneself in mission lands] is to not engage in arguments or disputes, but to be subject to every human creature for God's sake and to acknowledge that they are Christians." The Earlier Rule XVI:6 , Armstrong & Brady 1992:121). The Franciscan ideal of minoritas, identification with the marginalized by being oneself vulnerable and powerless, was also applied to the method of engaging in the missionary work of evangelization. Clare of Assisi, co-founder of the Franciscan Order, was the most ardent disciple of Francis and his views on Religious Poverty. Although from a noble and privileged background, she fought to institute an order of religious women completely dependent on charity for their economic support, thus participating in the economic insecurity of the poor and marginalized. Clare was the first woman in Church history to have authored a monastic rule for women and have it approved (Bartoli 1997:6). Her views on the "Privilege of Poverty" included strict rules against the acquisition of land, in stark contrast to all other orthodox religious communities. Clare struggled for over 35 years to confirm this Privilege and the final Papal approval of her Rule was put in her hands less than 48 hours before her death. Sadly, this remarkable document was literally buried with her and its radical prescriptions remained an ideal and not part of governing law. These teachings on poverty and powerlessness were the spiritual heritage of the Franciscans living in Hispanic California. This was the model by which their Franciscan life and vows were to be compared and tested. They were not only engaged in a missionary effort far from home, under very challenging conditions, sometimes harassed by their own government, responsible for thousands of persons and facing possible death, but they were also in a daily interior battle as to the living of their vows. A poignant statement of this concern is found in a letter Fray Mariano Payeras of Mission La Purisima Concepcion wrote to his superiors, "I ask: Does the Reverend Father Guardian [in Mexico City] and the Venerable Discretoria of our college already know what goes on here? Does a Franciscan missionary in this Province have a positive dispensation from the injunction against handling money and other parts of the Rule which are incompatible with residence at, and the spiritual and temporal management of, the mission he administers?" (Duggan 2000:234. Padre Payeras goes on to wonder if there is no express dispensation from the Pope, then is it sufficient that the King of Spain had assigned the Franciscans to the task of complete responsibility for the Christianized Indians. The Franciscan dilemma was deepening. Not only was there a concern as to compatibility of running the Missions with their vows. There was a question as to which master they were serving. The King was paying a stipend to the Franciscans. Was the King also determining the meaning of their vows? While Franciscans in Alta California had a life style probably all of us would find austere, in fact it was softened in some ways by the importation of luxury imported goods. Such goods included chocolate, rice, pasta, chile peppers, cinnamon, cloves, saffron, newspapers, snuff, whiskey and domestic furnishings, etc., made possible by the economic prosperity created by Indian labor. 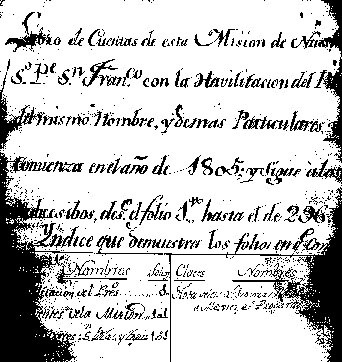 (Duggan 2000:218 and Appendix C and 1805 Mission San Francisco Account Book). Early visitors to California Missions, including La Pérouse, Langsdorff and Kotzebue spoke well of the food served at the padres' tables. Their descriptions of the food served to the Indians indicate considerably less delicate fare; the nutritional quality of Indian Mission diet is still a matter of debate (Duggan 2000:314-323). Dr. Marie Duggan, in her dissertation, notes the moral ambiguity of the Franciscan involvement in creating and managing major agricultural, manufacturing and ranching enterprises. As an example, one of the industries was leather tanning, which Padre Payeras acknowledged might be damaging the health of the Indian workers. It is a debatable issue of justice to knowingly continue an industrial enterprise which damages the health of one's workers when the sole justification is profit. After 1815, Franciscan correspondence was increasingly more focused on business issues than religious issues (Duggan 2000:235). It is no wonder that some witnesses and historians have described the mission system of Indian labor as slavery in effect, if not by intent (Archibald 1978:181) or as a slave system indistinguishable in its intents and efforts from that existing in Haiti (Margolian 1981:81 "Journals of La Pérouse') or the system administered for the Third Reich by Albert Speer (Churchill 1997:142-143). "Some of the brothers have taken to wearing socks. This is permitted if weather conditions warrant." "It is with heaviness in my heart that I have discovered that the brothers have departed from the most high poverty and obtained silver watches for their use. They shall be returned immediately to the syndics in Mexico for sale (Mission Dolores 1814, Book of Ordinances)." Apparently, the concern about Religious Poverty extended to what we would consider the minutia of daily life. ECONOMIC ASPECTS OF THE CALIFORNIA MISSIONS, Washington, D.C., Academy of American Franciscan History, 1978. FRANCIS AND CLARE. THE COMPLETE WORKS, London, SPCK., 1982. CLARE OF ASSISI EARLY DOCUMENTS, St. Bonaventure, NY, Franciscan Institute Publications, 1993. CLARE OF ASSISI, translated by Frances Teresa, OSC, Quincy, Il, Franciscan Press, 1993. LITTLE MATTER OF GENOCIDE: HOLOCAUST AND DENIAL IN THE AMERICAS, 1492 TO THE PRESENT, San Francisco, CA, City Lights Books, 1997. MARKET AND CHURCH ON THE MEXICAN FRONTIER: ALTA CALIFORNIA, 1769-1832, New York, NY, New School University, 2000. MISSION SAN FRANCISCO Chicago, IL, Franciscan Herald Press, 1924. FRANCIS OF ASSISI, translated by Helen Moak, New York, Crossroad, 1992. RELIGIOUS POVERTY AND THE PROFIT ECONOMY IN MEDIEVAL EUROPE, Ithaca, NY, Cornell University Press, 1983. MONTEREY IN 1786. LIFE IN A CALIFORNIA MISSION: THE JOURNALS OF JEAN-FRANÇOIS DE LA PEROUSE, Berkeley, Heyday Books, 1989. 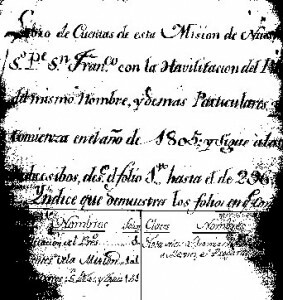 LIBRO DE CUENTAS (Account Book), unpublished manuscript, San Francisco, CA, Mission Dolores, c. 1805. LIBRO EN QUE SE CONTIENEN LAS ORDINES, (Book of Ordinances), unpublished manuscript, San Francisco, CA, Mission Dolores, c. 1814. Oxford, Oxford University Press and Cambridge University Press, 1989. ST. FRANCIS OF ASSISI: THE LEGEND AND THE LIFE, London, Geoffrey Chapman., 1999. Shoup, Laurence H. and Milliken, Randall T.
INIGO OF RANCHO POSOLMI: THE LIFE AND TIMES OF A MISSION INDIAN, Novato, CA, Ballena Press, 1999. THE DAILY OFFICE, THE PRINCIPLES OF THE FIRST ORDER London, Wellington House, 1992.